After using Azure ML last week, I received multiple emails to publish a tutorial on Amazon’s ML. Thankfully, some of my meetings got postponed and I got time to write this. Here is some more good news for you, I present you a tool which will make it even more simpler. It will just remove all the guess work you had to do with Azure ML in choosing model and splits. Obviously, I am talking about the Amazon ML tool. Unfortunately, this time you won’t get a trial pack but have to create your account giving up your credit card information. However, the tool is free to use and your credit card information is used only in case you breach the free tier. In this article, I’ve demonstrated a step by step tutorial to build machine learning model with Amazon. I’ve also shared a video tutorial at the end of this article. Let’s make our first machine learning model with Amazon ML tool. 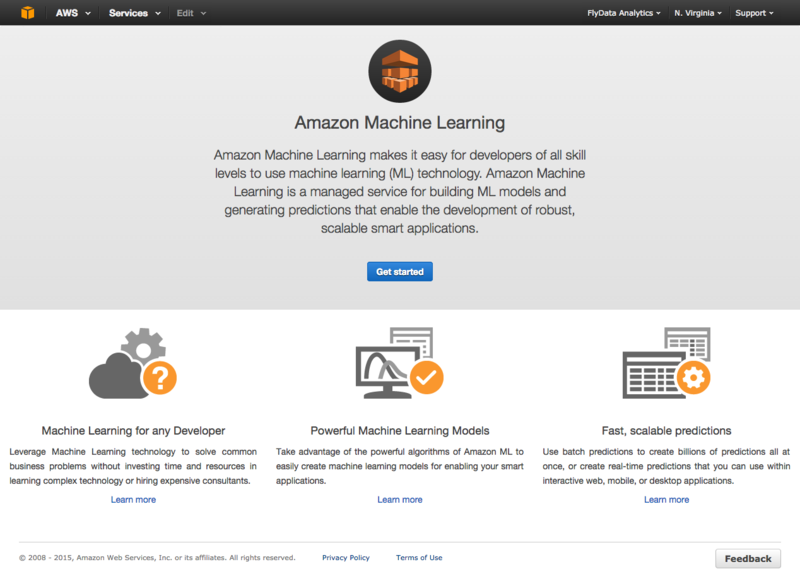 What’s New in Amazon Machine Learning ? Amazon is known for enhanced user experience, timely innovation and developments. Just 4 days back, Amazon added a feature for Random Data Splitting and Cross Validation. 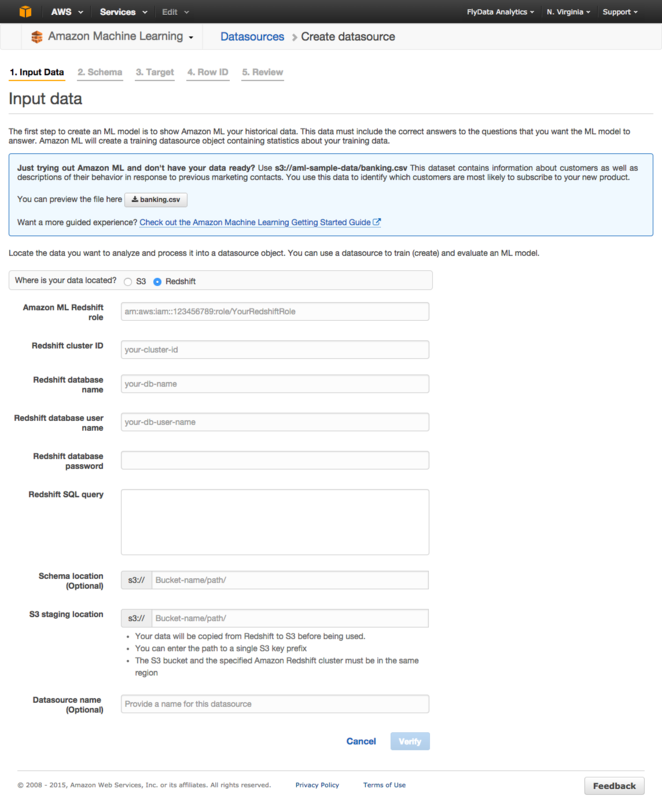 Now you can train and evaluate machine learning models based on random input data split. This will help you to avoid overfitting and produce more accurate evaluations. Last Month, Amazon enabled real time predictions feature which let’s users to preview real time prediction before creating the application. This features requires no code. It’s ‘push a button’ to get started feature. Data Analysis and Model Building Fees – It depends size of input data, number of variables, types of transformation and number of computation hours. For this, you’ll be charged $0.42 per hour. Prediction Fees – It can further be divided into Batch Predictions and Real Time Predictions. Batch Predictions are when your application obtain many predictions at once. In real time predictions, you can request predictions for immediate use via web, mobile or desktop applications. Batch Prediction costs $0.10 per 1000 predictions. Real Time Prediction costs $0.0001 per prediction. Let’s get to work now! 1. Once you sign in, You’ll find this as the main page (shown below). 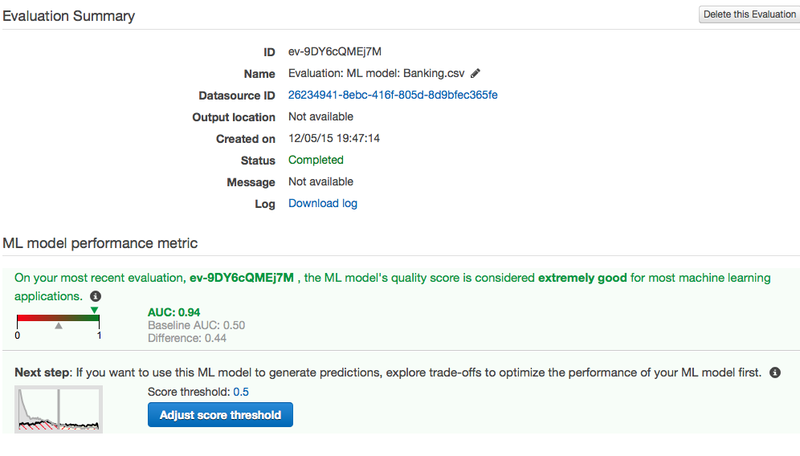 Now, select Machine Learning models to move to the first page of ML tool. 2. Next step is to input a data set. 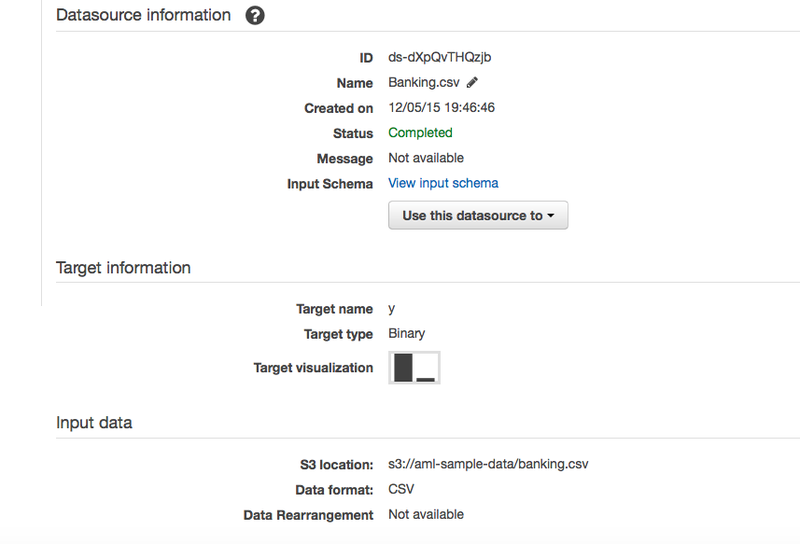 In case, you do not have any ready data set, you can use the one suggested in the dialogue box “banking.csv”. 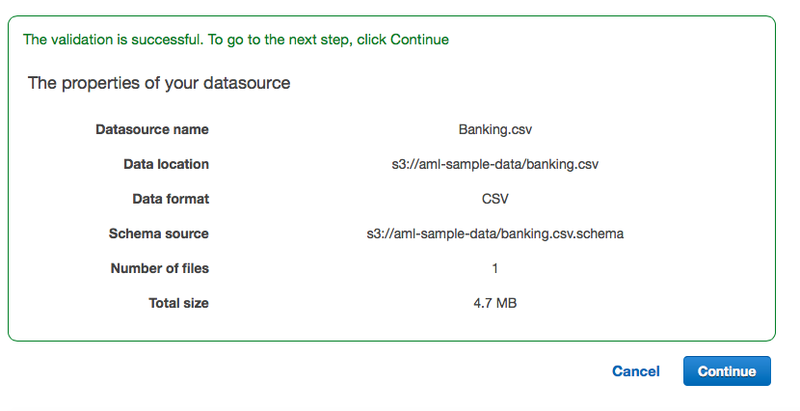 Select S3 as the option (aml-sample-data/banking.csv). Once the data set is loaded successfully, you’ll get a dialogue box of ‘validation successful’. 4. Press “Continue” to move to the next screen. You’ll now find all variables and a sample data. One thing you need to make sure is the target tag. This is your dependent variable. In our current example, the target is “y”. Hence, you see a mark in the Target column. 6. Finally, you press “Finish” and you are done. To check the results, go to Dashboard. Amazon ML tool is a really good tool for visualisation of data and results. The time which the tool take is slightly on the higher side when I compare it with H2O or other similar tool kits. However, the entire process is exceptionally simple to execute. 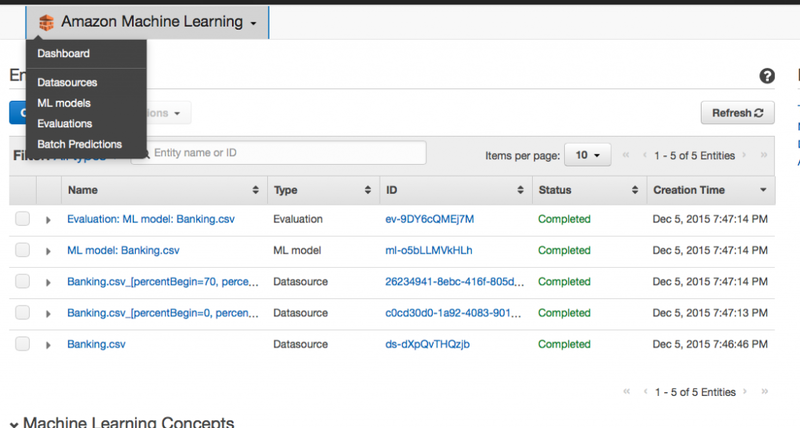 In this article, I’ve demonstrated a step by step process to build a machine learning model using Amazon ML service. As you have seen, it’s quite simple and ‘codeless’ process. So, people who find coding to be intimidating should use such services often. Did you find this article helpful ? Share with us your experience with Amazon Machine Learning tool. Nice article and very easy to follow. The whole tutorial takes a max of 10 mins of ML processing time. Unfortunately the ML module kicks off other ongoing stats processes which keep billing you in the background with no obvious visibility. Could you publish a tutorial on how to use H2O? I’m an absolute beginner when it comes to H2O but have tried Azure ML before, if this info helps.